Name: TotodileType: WaterSpecies: Big Jaw PokémonHeight: 0.6 m (2'00″)Weight: 9.5 kg (20.9 lbs. )Interesting Facts: Totodile are very powerful especially underwater. They have very powerful jaws and have a bad habit of biting anything they see. So better not turn your back on a Totodile. They, however, are always ready for a laugh and are very playful. 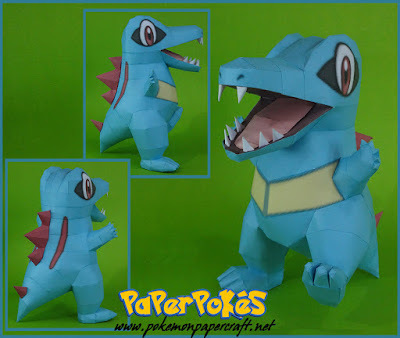 Evolves into Croconaw then to a Feraligatr. NOTES: Start at the top of the mouth, building the nose first and the head around it. Be careful with the fingers, they are the hardest part, I really suggest tweezers to build them. Glue the details before closing at the tip of the tail. You can either build the base of use weight inside to make it stand, keep in mind that it took me some weight for it to stand, just add it a little bit at a time and place on a flat surface to see if it stands. Further instructions and numbers at the pdo.